The Infinium Global Research analyzes the report of Bottle Blowing Machine Market over the period of 2018 to 2024. This report also provides detailed qualitative and quantitative analyses of the market dynamics, market size and future trends in Global Bottle Blowing Machine Market. It will help a lot of decision makers to develop strategies and find new opportunities in the Global markets of Bottle Blowing Machine. The report covers market changing aspects including drivers, restraints, opportunities, and trends expected to encouragement the expansion of the Bottle Blowing Machine Market during the said period. The report also provides market attractiveness analysis, by geography, and market share analysis, by key players respectively. Some of the prominent participants in the Global Bottle Blowing Machine Market are KHS GmbH, Sidel, Aoki Technical Laboratory, Chumpower Machinery Corp, Nissei ASB Machine Co., Ltd., , Sacmi Imola S.C, Krones AG, Zhejiang East Zhouqiang Plastic & Mould Industry Co. Ltd. Etc. and Guangzhou Tech-Long Packaging Machinery Co., Ltd, SMI S.p.A. According to report the global bottle blowing machine market is projected to grow at a CAGR of 2.90% over the forecast period of 2018-2024. Bottle blowing machines is a mechanical equipment used in the process of manufacturing bottles. Bottle Blowing Machine is widely used in beverage, pharmaceutical, cosmetics, food, and chemical industries. Bottle blowing machine creates plastic bottles according to the capacity of the contained liquid. This machine is used in the industrial applications such as mineral water bottles, carbonated beverage bottles, cosmetic bottles, and oil bottles in order to ensure that machine offer optimum performance. The growing food and beverages industry drives the growth of the bottle blowing machine market. Moreover, the demand for packaged drinking water, juices, and milk products are witnessing rapid growth leading to the greater demand for sophisticated bottling solutions. However, huge uncontrollable waste produced due to plastic on a global level is forcing governments to restrict the production and sale of plastic bottles, which can limit the demand for the bottle blowing machines. The bottle-blowing machine manufacturers need to invest in new and efficient recycling technologies readily integrated into the bottle-blowing machine can create sustainable growth opportunities for the bottle blowing machine industry. Furthermore, the combination of plastic recycling which is an efficient and environmentally friendly practice is further anticipated to provide several growth opportunities for the key players in the bottle blowing machines market. On the other hand, bottle blowing machine manufacturers are now focusing on incorporating new technologies into the machine. They are replacing semi-automatic bottle blowing machines with automatic bottle blowing machine that has enhanced features, which further eliminates the possibility of errors caused due to machine inaccuracy. Among the geographies, North America dominated the global bottle blowing machine market. North America and Europe, together account for nearly 50% of market share in the bottle blowing machine market as the majority of the manufacturing companies are in the North American regions. Moreover, the markets in China and India are being heavily invested which may uplift the demand for bottle blowing machines in near future. The report on global bottle blowing machine market covers segments such as, machine type, technology type and end-use. 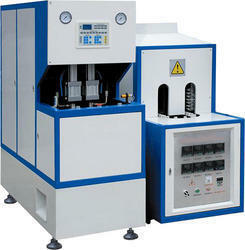 On the basis of machine type the global bottle blowing machine market is categorized into automatic and semi-automatic. On the basis of technology type the global bottle blowing machine market is categorized into injection blowing machine, extrusion blowing machine and injection stretch blowing machine. On the basis of end-use the global bottle blowing machine market is categorized into food and beverages, pharmaceuticals, cosmetics and personal care and consumer goods. The report provides profiles of the companies in the global bottle blowing machine market such as, KHS GmbH, Sidel, Aoki Technical Laboratory, Chumpower Machinery Corp, Nissei ASB Machine Co., Ltd., , Sacmi Imola S.C, Krones AG, Zhejiang East Zhouqiang Plastic & Mould Industry Co. Ltd. Etc. and Guangzhou Tech-Long Packaging Machinery Co., Ltd, SMI S.p.A.,. The report provides deep insights on demand forecasts, market trends and micro and macro indicators. In addition, this report provides insights on the factors that are driving and restraining the global bottle blowing machine market. Moreover, IGR-Growth Matrix analysis given in the report brings an insight on the investment areas that existing or new market players can consider. The report provides insights into the market using analytical tools such as Porter’s five forces analysis and DRO analysis of bottle blowing machine market. Moreover, the study highlights current market trends and provides forecast from 2018-2024. We also have highlighted future trends in the bottle blowing machine market that will impact the demand during the forecast period. Moreover, the competitive analysis given in each regional market brings an insight on the market share of the leading players. This report will help manufacturers, suppliers and distributors of the bottle blowing machine market to understand the present and future trends in this market and formulate their strategies accordingly.